Peel the pumpkin or squash and cut into cubes. Peel and chop the shallots and garlic. Gently sauté the pumpkin in oil together with the onion, garlic and thyme. Add bouillon and boil for 15 min. Add the whipping cream and boil for another 5 min. Remove the thyme sprig and blend until smooth and creamy. Season to taste with salt, pepper and cider vinegar until the right balance is achieved - the sweet pumpkin should be seasoned liberally to prevent the soup from becoming too one-sided in flavour. 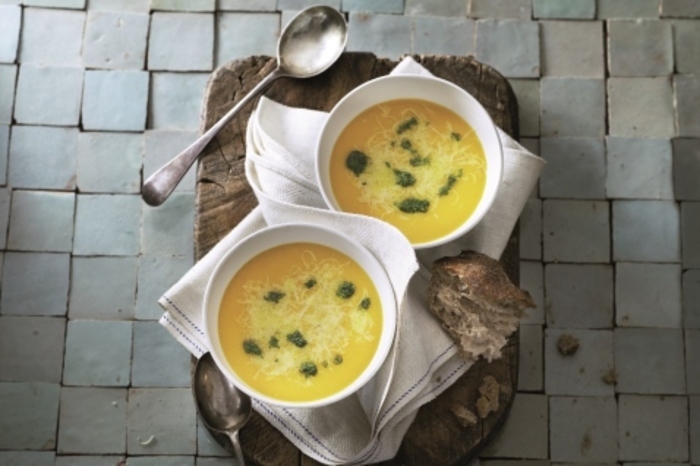 Serve the soup piping hot with grated Prima Donna, herb oil and bread on the side. Rinse the herbs in cold water and dry thoroughly. Tear the herbs into large pieces and combine in a blender with the oil, finely grated lemon zest, salt and pepper. Blend into a green, smooth herb oil. Pour the herb oil into a glass or airtight container.